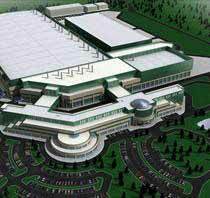 Malta NY - The new building project in Malta, the construction of a $4.2 billion dollar semiconductor facility on 223 acres of land, was set in motion in mid-June. The construction, estimated to take around two years, is expected to bring new jobs and revenue into the area as different skills and materials will be in demand. The building, when completed, will belong to GlobalFoundaries, a partnership of Advanced Micro Devices, Inc. (AMD) and two Abu Dhabi investment funds. Currently, the building's construction is directed by the German based construction company M+W Zander Holding AG, who specialize in advanced wafer fabrication design. When completed, the building will be home to a chip fabrication plant. The foundation will be a solid mat of three feet thick concrete, to stabilize and control vibrations. The plant will sit on 223 acres of land, and 200,000 square feet of its space will be taken up by process tools. Job openings in Malta for positions such as contract labor, maintenance services, landscaping, and security are expected to come from this chip plant, as well as the demand for skilled and well-trained tech personnel and management staff.